If you are a computer engineer already and you don't know how to troubleshoot a sick PC, well it's a shame(don't mid this, read further). If not, well ladies and gents, today I will be giving you some life-easing tips to trouble shoot your sick PC, even laptop in some cases. This post will give you an idea of how a computer works and let you figure out what is wrong with your PC and how you can fix it or get it fixed. I'm myself a computer science engineer. To be honest they don't teach any of such things in schools and colleges. It's a shame on the system. Let's cut the crap and move to the core part. A computer or PC abbreviated from Personal Computer consists of a mother board, CPU, RAM, Hard disk and input output units. Depending on the complexity of the system you can have a GPU(graphics card), more RAM, other cards such as Ethernet, WiFi etc. We are going to consider a basic PC with a graphics card because they are quite common these days. Let's begin with turning on the system. Case 1: PC won't start. 1. SMPS or PSU not working. It's a box in your system from which all kinds of wires are coming out. 2. Loose connection between the SMPS and motherboard. 3. Processor assembly isn't proper. 1. If you have a faulty SMPS or PSU, get it replaced or repaired. We are computer engineer not electrician. 3. Remove the CPU fan and carefully remove the CPU. Check if the processor pins are alright(not burnt). Clean up the white substance on the processor and CPU fan. It's called Thermal Paste or Heat-sink Paste. You can get it from any computer repair shop for half a dollar or less. 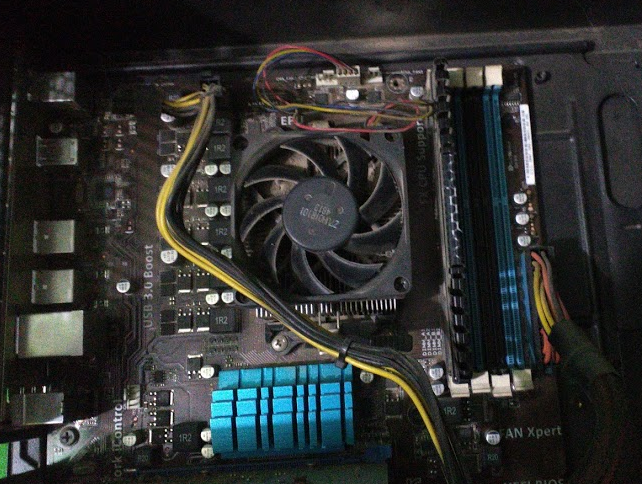 Place the paste and reinstall the CPU and CPU fan. Case 2: PC starts but shuts immediately or after sometime. Possible causes: 1. CPU assembly improper. Remove the CPU fan and carefully remove the CPU. Explanation: The CPU is the core of the PC and it really gets hot. I mean really hot and really fast. Faster than the mood swings of your girlfriend. So it needs a proper heat reduction or whatever you will call it. CPU fan does that job for us. Case 3: PC won't start and making stupid beeps. In case you are using a different mother board you have to Google that out yourself and fix it accordingly. Solution: What do you think I am? A wizard?